5.7 miles through a spectacularly rugged part of Mount Diablo, where waterfalls seem to appear out of thin air like a magician pulling rabbits out of his hat. Finally, it rained! 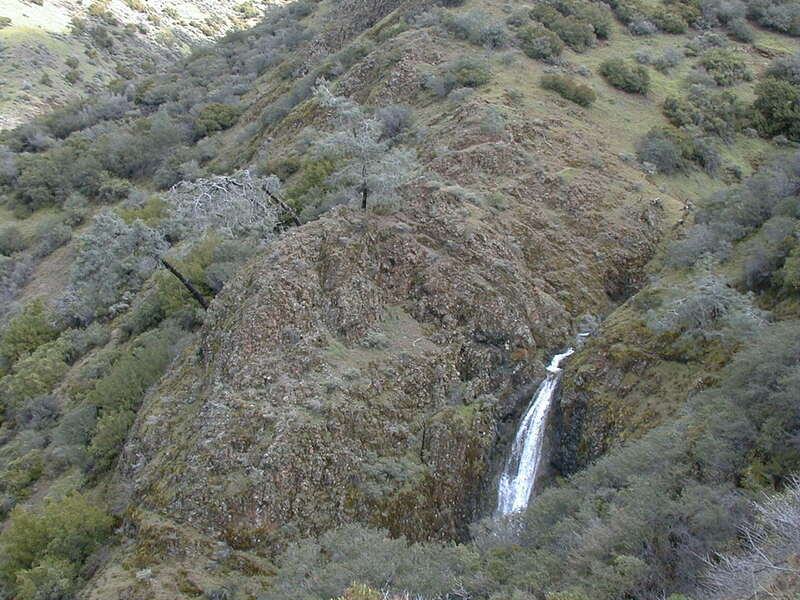 The hills are greening up, manzanitas are blooming, and waterfalls are cascading merrily down Mount Diablo's back side. Look for early wildflowers and wintering ladybug colonies. The falls are at their peak after days of heavy rain, but even when the water is just trickling this is a super gorgeous hike, with majestic stands of oaks, lush grassland, and diverse chaparral. Summer and autumn are hot and dry, so plan to squeeze this hike in before then. Prepare to get muddy on Donner Canyon Fire Road and to get your feet wet crossing Donner Creek. On the way to Falls Trail avoid one slick section of trail prone to mud and the creek crossing by taking Wasserman Trail via Bruce Lee Springs Trail (junction is near the Donner Cabin site). At the end of Wasserman Trail, turn right and descend Cardinet Oaks Fire Road a short distance to Falls Trail. If you're not familiar with these trails, be sure to take a good map. Donner Canyon is hike number 29 in 60 Hikes in 60 Miles: San Francisco (third edition). Read about this hike on BAHiker. Waterfalls will really be gushing this week in the north bay, which received the most rain over the weekend. Dawn Falls is a small, very charming waterfall in the midst of lush woods near Larkspur. This easy hike is a good one for small kids.